Skagway, originally a gold town located on the Inside Passage about 90 miles northeast of Juneau sits at the head of Taiya Inlet. The city is the most northern stop for the Alaska Marine ferries travelling up Alaskas' Inside Passage and is approximately 110 road miles from Whitehorse. As the most northerly port on the Inside Passage ferry route beginning in Bellingham WA, Skagway is an ideal point from which to turn inland and begin a driving tour to explore of the rest of Alaska. For history buffs, the Klondike Gold Rush National Historic Park recreates the days of the gold rush with immaculately preserved buildings and storefronts. 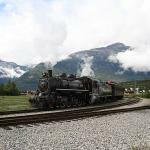 For rail buffs, Skagway is the starting point for the popular excursion to the summit of White Pass on the White Pass & Yukon Railroad. Travelling through tunnels and over trestles in replica vintage parlor cars has made this 3 hr narrated trip North America's busiest narrow gauge tourist railroad.